Cloud services are already the top of mind of most enterprises and this interest is driven by a desire to significantly improve business and IT agility, minimize risk and lower IT costs. How technology can help to support the speed of the business changes, but with less resources, less investment and more economically? This is a real challenge given this tough economic climate, along with the businesses need for anytime, anyplace, anywhere IT. Business forces have caused IT to figure out how to provide flexible services faster, but, without large, up front investments. Cloud solutions can provide flexibility, less investment and responsiveness needed to achieve significant business value. No hardware to install, No software to download. No server to maintain. No licenses to manage. Just sign up and we will manage the setup, implementation and maintenance. Flexibility – You business needs more space, resource, bandwidth than usual, a cloud-based service can instantly meet the demand because of the vast capacity of the service’s remote servers. Disaster Recovery - Cloud computing providers take care of most issues, and they do it faster. The restoration time is faster than businesses that didn’t use the cloud as they don’t need to put too many resources for the disaster recovery. Cap-Ex Free - Cloud computing services are typically pay as you go, so there’s no need for capital expenditure at all. And businesses have minimal project start-up costs and predictable ongoing operating expenses. Work from Anywhere - As long as employees have internet access, they can work from anywhere. This flexibility positively affects knowledge workers' work-life balance and productivity. Document Control - Cloud computing keeps all the files in one central location, and everyone works off of one central copy. Security – if you lost laptop or portable devices. This can have some serious monetary implications, but when everything is stored in the cloud, data can still be accessed no matter what happens to a machine. 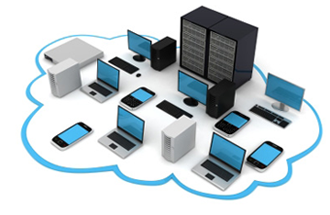 Cloud Servers provide open platform supporting your business. We dedicated virtual server, space and memory resources for your applications. Cloud infrastructure can support customer to build and deploy private clouds in our data center. If you require high security to protect the critical information, or you need a high degree of control over your cloud, deploy and manage your own private cloud is more appropriate. Enjoy MS Exchange enterprise email platform and functionality, but don’t need to own any hardware, software and license. It just takes a few minutes to activate a new email account for your employee. You don’t need to waste time for the server installation, administration and maintenance. 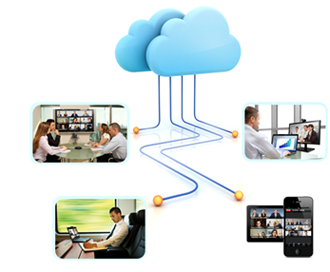 Cloud Voice service delivers you an experience how unified communications can collaborate of scalable voice & video on your IP phone and mobile devices, such as high quality face-to-face video call, instant messaging and mobility. It also supports a range of popular communications devices ranging from IP phone, iPhone, iPad, smartphone or computer to meet your business communications needs. Support high quality video call with your partners and colleagues that will definitely boost communications and production efficiency. While you are on the road with WiFi access, you can turn your mobile device such as iPhone or smartphone into your virtual desktop phone displaying your office extension number to make and receive calls as if you were in the office. Remote offices in different territories can connect to Cloud Voice platform and communicate seamlessly and securely with one another by simply dialling internal extension number. It is annoying to keep calling your colleague or waiting to be answered while the other side is not available or busy. Presence Communicator keeps you informed of the availability of any internal parties. You can reach your colleagues at the right moment when they are available. Support data access in anyplace, anywhere and anytime from the office and external. You don’t need to invest any hardware, software, license and installation cost for set up a storage server anymore. Protect the lost of the important data if any human error or unexpected disaster. You don’t need to worry about data lost anymore and our monitor tool can monitor backup job is successful or failure. Compression reduces the size of backups to minimize transmission time and storage costs. Data is compressed before transfer to the cloud. Monitoring tool can monitor the backup job is successful or failure and emailed report keep us informed on backups synchronized to the cloud.